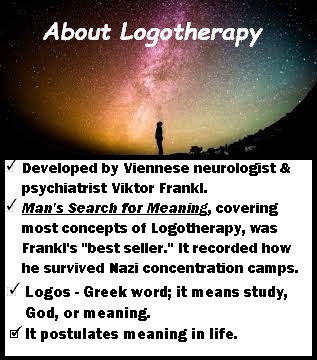 Through my work as an existential logotherapeutic coach, I help people find meaning in everything in their life, including work, family relationships, and in situations where they face insurmountable suffering. I do this mainly by working with the power of forgiveness. In my home country, Colombia, forgiveness seems like an impossible task for many. With a history of more than 60 years marked by war, drug trafficking and constant conflict, entire populations have now had to confront a hard question: will they forgive those who horribly hurt them even if they never asked for forgiveness? This made me look for ways I could help those clients who had to leave their home behind, fearing for their safety, and who came to a city that in more than one occasion, receives them with a hostile environment and not much help. Many people with deep wounds derived from the conflict and a past of violence, resentment and vengeance. As I looked for ways to help, I researched many therapies, but with time, I found them temporary or incomplete. I also looked into the initiatives of religious groups, and though they were having some admirable results, they did not appeal to non-believers. Then I heard about the International Forgiveness Institute, and all their research on how forgiveness is a psychological matter, not only a religious one. I was personally impressed by their focus on forgiveness’ impact on psychological issues such as anxiety, depression, and others as measurable variables. For me, it meant that now we can present evidence that forgiveness works and can in fact change hearts! Finding meaning and forgiveness in a life full of resentments is crucial to heal. To see the offender as a human being and giving them what they deserve in dignity and love, changes your life and theirs. It restores justice even without reconciliation. 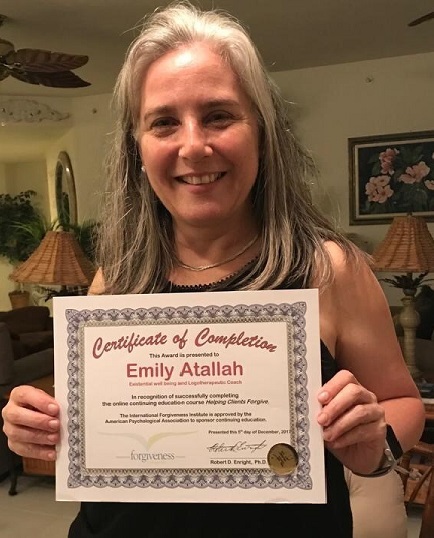 Emily Atallah, Existential well being and Logotherapeutic Coach, with her “Helping Clients Forgive” Certificate of Completion. Forgiveness gives you a second chance for a meaningful and happy life, an opportunity to live a better, healthier, fulfilling life where people reach for their dreams without the weight of resentful thoughts. As a life coach, I found particularly reassuring and helpful to learn that forgiveness has a measurable impact on the people I treat despite what the offense was. My time studying at the Forgiveness Institute gave me more tools to better treat my clients, to measure their progress and to encourage them to strive for a better and more meaningful life. I encourage you to give yourself the opportunity to see forgiveness in a new light and learn about its healing power, by taking the online “Forgiveness Therapy” course through the International Forgiveness Institute. Forgiveness News, IFI News, Newscoach de vida, Education, existential logotherapeutic coach, forgive, forgiveness, forgiveness coach, Forgiveness Education, forgiveness journey, Forgiveness Process, forgiveness therapy, Forgiving, helping clients forgive, life coach, Why Forgive? Emily Atallah with her “Helping Clients Forgive” Certificate of Completion. I encourage you to give yourself the opportunity to see forgiveness in a new light and learn about its healing power, by taking the online “Helping Clients Forgive” course through the International Forgiveness Institute. Your Forgiveness Storycoach de vida, Education, existential logotherapeutic coach, forgive, forgiveness, forgiveness coach, Forgiveness Education, forgiveness journey, Forgiveness Process, forgiveness therapy, Forgiving, helping clients forgive, life coach, Why Forgive?